Exhibition of art in the public space is a reaction to the revolution of 1989 and its unfulfilled ideals. Artists ask themselves the essential questions – how did our society improved since then and whether the changes weren\'t more of a disappointment. The state of today\'s society is more likely apathetic. Is contemporary art able to talk to the public and wake it up from its sleep? Huge flower pots are undeniably connected with the aesthetic of the communist regime, they symbolized official places – e.g. offices or stations. They tried to disguise a hostile atmosphere or decay of such places. At the same time they served as ostacles in the public space which was controlled and unfree. These vital plants have been „decorating“ interiors of many state institutions until today. They still conceal imperfections and gloominess. 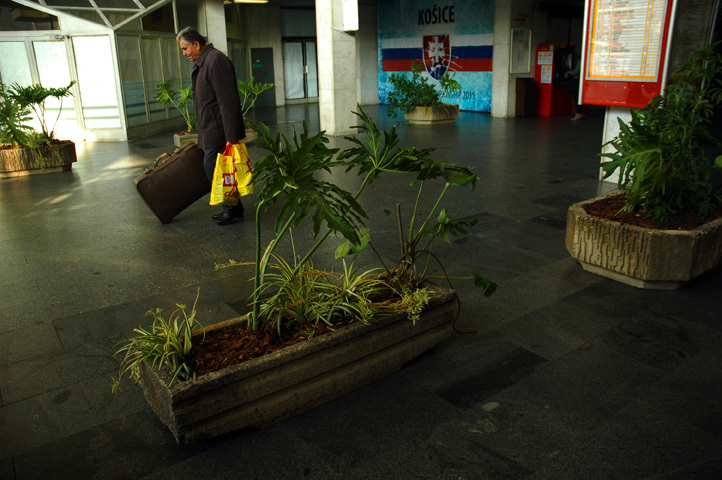 The original concept of the work was violated by a lady from an administrative building of the Railways of the Slovak Republic, who exactly defined the space where the plants could be placed. A row of flower pots draws the line of a permitted installation.